Inflammation is our body’s response to foreign invaders such as harmful bacteria and viruses to prevent infection. It can also happen as an error message with autoimmune diseases such as joint problems. Synovitis affects several joints, mainly the knees, and can lead to limited movement of the affected joint. We will explore the causes of this inflammation and possible treatments. Synovitis occurs when the membrane that lubricates and protects the bones from friction damage becomes inflamed. This clear, thick synovial fluid of the membrane is found surrounding the joints of the ankles, knees, hips, shoulders, and wrists. The excess fluid secretion is a result of various factors, which cause excruciating pain, swelling, and lack of range of motion. Synovitis causes usually have a link to incidents of trauma and related health conditions. This association and the symptoms separate it from similar joint conditions, even though there is a risk of misdiagnosis. One of the health conditions closely linked to this type of inflammation is rheumatoid arthritis. As the inflammation with this condition increases, it stimulates inflammation of other tissue cells, thereby causing an increase in pain receptors. The symptoms are distinguishing as there is severe pain, swelling, redness, and warmth surrounding the joint. Where Can Synovitis Happen in the Body? As synovial fluid cushions the joints, synovitis can be present anywhere in the body. It can happen in the jaw, shoulders, wrists, hips, knees, and ankles. It can also affect more than one joint region at the same time, depending on the causing factors. The inflammation of the temporomandibular joint may see problems with the movement of the region, such as chewing, yawning, and even opening the mouth. Pain may radiate from the jaw to the neck, ears, and head. A synovitis shoulder can affect one or both shoulders at the same time, and results in difficulty raising the arms and hands for even the simplest of tasks. The main symptom is pain in the shoulder. Inflammation of the wrist affects the motor skills of the hand as well. Movements such as lifting or writing can cause pain in the wrist and lower arm. There is a great deal of pressure applied to the hips with bending and walking movements. Synovitis may make these and other motions of the hips difficult and painful. This form of synovitis seems to be the most common, as it can affect the act of bending the knee and walking. Excruciating, shooting pain in the knee is a usual complaint. Synovitis in the ankle joint region can be compared to that of synovitis of the hip. 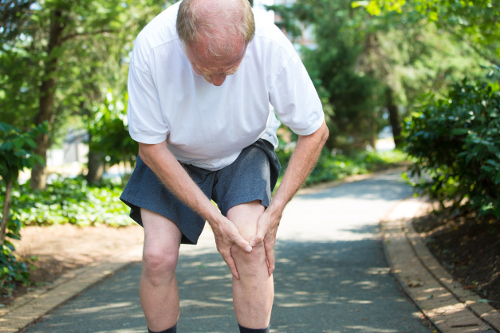 The act of walking brings on severe pain and limping can usually be seen in a person. We mentioned that synovitis could sometimes get misdiagnosed, even though the symptoms and close relation to other health condition are what separates it from other joint issues. A correct diagnosis takes into consideration not only the symptoms presented, but also the results of specialized tests of the joint and synovial fluid. The doctor will look at your medical history as past symptoms, illnesses, injuries, fevers, infections, or autoimmune diseases may offer an explanation for present symptoms. Basic laboratory tests such as a complete blood count will detect any issues relating to the joint. Based on the swelling, redness, and any warmth to the touch of the affected joint region, a synovial fluid analysis may be done. It can determine the extent of the inflammation and possible cause, such as arthritic conditions including gout or infection. The synovial fluid is withdrawn by a needle, usually in a medical clinic or hospital setting, and takes only 30 minutes to complete. Other tests can include a bone scan, x-rays, or ultrasound. A patella tap test may also be done to look for any swelling around the muscle. This test is done by firmly pressing on the region just above the knee. Anti-inflammatory drugs are the primary source to treat swelling and pain. Steroid, corticosteroids, aspirin, and ibuprofen are commonly prescribed. In cases of severe pain, immediate relief may be offered with a procedure to drain the synovial fluid from the joint, as is commonly done with synovitis of the knee. This procedure is a temporary measure as the fluid will continue to collect in the area. Surgery is also an option to remove the affected tissue. The procedure involves the removal of a portion of the synovium. In extreme cases, the surgery will involve complete joint replacement. Less invasive treatment options include applying ice and heat packs to combat pain and swelling. Resting the joint is recommended to avoid movement during the healing process. Another treatment option can include splinting or the use of a brace. It is also recommended to avoid placing weight on the joint, especially if the synovitis is within the knee, hips, or ankles. If the shoulders or wrists are involved, avoid the motions of carrying, lifting, and wiping. Synovitis of the jaw can be difficult, as opening the mouth wide such as with yawning can be painful. You should opt for a soft food diet during the healing time. Depending on the severity of the condition, the location, and the duration of treatment, rehabilitation of the affected joint may be required. Rehabilitation will help improve any loss of range of motion, as well as alleviate any lingering pain. Synovitis affects millions of people who can lead healthy and productive lives with the right treatment. This disorder affects major joints of the shoulder, wrist, hip, knee, and ankle, with the knee being the most affected. Related joint conditions can cause this condition to be present with debilitating symptoms. Overworking the joint can also cause the protecting fluid to become inflamed. Treatment options depend on the severity of the condition and include therapy that you can do at home. “Synovitis,” MedicaLook; http://www.medicalook.com/Joint_pain/Synovitis.html, last accessed April 26, 2017. “Synovitis of Knees, Hips, Ankles, Shoulders, Wrists, Jaw Joint,” ePain Assist; https://www.epainassist.com/joint-pain/synovitis-of-knee-hips-ankles-shoulders-wrists-and-jaw-joint, last accessed April 26, 2017. “Synovitis,” Health Central; http://www.healthcentral.com/encyclopedia/hc/synovitis-3168399/, last accessed April 26, 2017.